Cologne is steeped in history and culture, and this university city certainly knows how to have a good time too! The magnificent Gothic Cathedral truly is a sight to behold. From there you can look out upon the elegant old town, some stunning modern architecture and riverboats passing underneath Hohenzollern bridge. Explore Cologne’s scenic streets and you’ll find gourmet restaurants, stylish bars, a wealth of museums and friendly locals to practice your German with! With a German course in Cologne, you’ll not only improve your German language skills greatly, but you’ll also have an unforgettable time in one of Europe’s most attractive cities! 15% off German courses in Cologne! Receive a 15% discount off your German course in Cologne! Accommodation and private lessons not included. Our school is located in the city centre, within walking distance of the Cathedral, and offers great access to Cologne’s convenient public transport system. After your German lessons, you can socialise with other students in one of the inexpensive restaurants nearby or take a short stroll down to the banks of the Rhine. Although relatively small compared to other German language schools, our Cologne school has excellent and modern facilities with 5 classrooms, a student kitchen (a popular place to convene during breaks and after classes) and free Internet access. Moreover, our school’s friendly staff will help you in any way that they can. 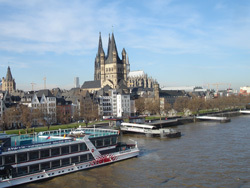 Our school offers you a variety of different German courses in Cologne. It is possible to choose between the Intensive course of 20 lessons per week, or the Super Intensive course of 25 group lessons per week, which includes five extra classes focusing on communication. Both of these options are perfect for any students who would like to improve their general German skills and meet other students from around the world. Another option is the Mini Group course, which has a maximum class size of just 6 students in each class, ensuring that each student has more personal attention. If you feel that you’d benefit from dedicated, one-to-one tuition, Private Lessons are available too. You might want a mixture of both group and individual lessons, in which case our school’s Intensive + Private Lessons course of 20 group and 5 or 10 private lessons per week is perfect! We also offer special interest courses, which are great for students who are learning German for a specific purpose. Classes focusing on Business German, Exam Preparation and German Pronunciation can all be added to our general courses. If you have any questions about any of our German courses, please do not hesitate to contact us. Another way to dramatically improve your language skills is to live with a German host family whilst you learn German in Cologne. Local families (or single hosts) are carefully selected by our colleagues at the school and will only speak to you in German. Simply decide between a bed and breakfast or half board arrangement. Want to have more time with your fellow students? Then choose to live in a shared apartment, where you’ll have a single room (or you can book a shared room if preferred) and share bathroom and kitchen facilities with other students. Cook for yourself and have a great time with students from all over the world! For those who prefer a little more comfort we also offer shared apartment plus accommodation, which offers the same facilities as a standard apartment but also includes a washing machine, dishwasher and WI-FI internet connection. If you prefer to live independently and have your own space, a studio apartment would be a good choice. Studio apartments offer a small kitchen, WI-FI and private bathroom. To make sure that you really enjoy your time in Cologne, our school arranges a wide variety of activities three times a week. Typical activities include guided sightseeing tours, museum visits, cultural attractions (festivals, theatre, concerts etc), school parties, German film evenings, international evenings, and visits to Cologne’s beach bars, pubs and discos! Our school also organises excursions to other historic cities. If you fly into Cologne airport, we can arrange a private airport transfer to pick you up and take you directly to your accommodation upon arrival. Please note, however, that this service is not included in the price and will incur an additional fee. Average score for our school in Cologne based on 6 previous client reviews. All materials were provided for us which was a bonus. The course was efficient and clear. I felt we had a really good teacher who took the time to explain things. We covered a lot in a short space of time which was brilliant. I would highly recommend this school. It was extremely reasonably priced, they were helpful and sociable and encouraged us with our German speaking. I was very impressed and would like to go back. Good level upon entry. Friendly teachers, could be a bit more corrective but they do encourage free speaking. Excellent accommodation! Very friendly, helpful host, great location, clean and good Food!